We take pride in providing you with the highest level of customer service. We take the time to answer any plumbing, drain, air conditioning, air quality or irrigation questions you may have about your home or business. We’re so confident you’ll be happy with our level of customer service that we guarantee it! Art Plumbing, AC & Electric will return to your home for the life of the product we installed to correct any installation or workmanship issues free of charge. Art Plumbing, AC & Electric will return to your home to repair and or replace any part, product, or piece of equipment we provided and installed for two full years from the date of installation – free of charge. Note: Some items covered by the manufactures warranty may require factory authorized in home service. Art Plumbing, AC & Electric will pay for you and your family to stay at a local hotel if we cannot repair the air conditioning system we installed within 24 hours of your call for service. This guarantee is good for the first five years after your system is installed. Art Plumbing, AC & Electric will pay for you and your family to stay at a local hotel if we cannot have the water on to your home due to an issue with a plumbing repair or installation we performed within 24 hours of your call for service. 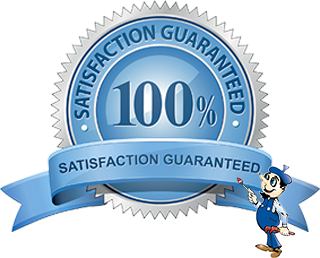 This guarantee is good for up to five years after your repairs or installation. Art Plumbing, AC & Electric will leave your home as if we were never there. If you are not happy with the way we leave your home, we will send a professional cleaning company to clean up free of charge and treat you and your family to dinner. Our service and installation technicians are the best in skill, attitude, and workmanship. We will care for your home and complete our work with speed and precision. We will not smoke, or swear, and we are a drug-free company. If we have not performed in accordance with these high standards, we will pay you $200.